New research from the University of Tennessee indicates that the Gulf of Mexico has a natural ability to clean itself, even in the wake of an environmental disaster like the Deepwater Horizon oil spill that caused an estimated 210 million gallons of oil to flow into the gulf after an explosion on the oil rig killed 11 men and ultimately caused the worst offshore oil spill in U.S. history. According to Terry Hazen, a reseacher at University of Tennessee and Oak Ridge National Laboratory Governor's Chair for Environmental Biotechnology, a there are previously unknown and naturally occurring bacteria in the Gulf that consume and break down crude oil. 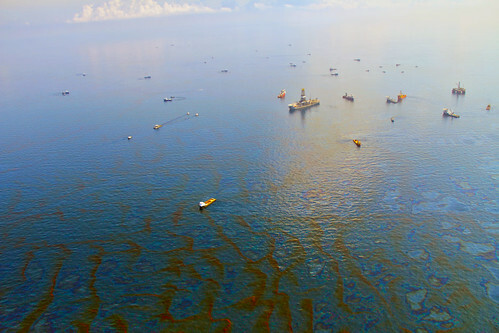 "The Deepwater Horizon oil provided a new source of nutrients in the deepest waters," said Hazen in a press statment. "With more food present in the water, there was a population explosion among those bacteria already adapted to using oil as a food source. It was surprising how fast they consumed the oil. In some locations, it took only one day for them to reduce a gallon of oil to a half gallon. In others, the half-life for a given quantity of spilled oil was six days." Still, the findings do not provide a green-light for continued deepwater oil drilling, nor do they indicate the net environmental effects of such a major oil spill. Hazen told U.S. News and World Report that there may still be ongoing environmental impacts from the spill, which devastated the Gulf economy for months and killed thousands of animals. "We don't know what the overall effects will be-the bacteria and the plankton and fish were swimming through oil and oil droplets for weeks," Hazen said, according to U.S. News. "We don't know what the effect will be but it probably wasn't good." He told U.S. News that the environmental impact would have been worse if the spill occurred in water other than the Gulf of Mexico. Though oil-eating bacteria have been found in other oceans, those in the Gulf seem to degrade oil faster than other species, Hazen said. "We should certainly be worried about how resilient they will be-there could be a tipping point somewhere that overwhelms the gulf's ability to clean itself up," he said. Deepwater Horizon's operator, BP was ordered to pay $4.5 billion in damages because of the spill, though BP is appealing the way a court-appointed administrator is apportioning the payments. The editors of Wikipedia also recently accused BP of having a employee alter the "BP" article in a way that puts more favorable light on the oil company.